PARK DRIVE || renovation in McMinnville — MD HANEY & CO.
About 1 1/2 years ago, we met the nicest couple who fell in love with this little corner of Oregon. Who wouldn't? It's so beautiful out here with the mild seasons and rolling hills of vineyards and farmland! Anyways, this couple is incredibly kind, very creative, inspiring and ambitious! It was a joy to work with them and we wish them so much success with their hospitality ventures here in Yamhill County. Don't we all love the curb appeal of old homes? Classic architecture that you just don't see in most new homes!!! You don't notice much change from the outside....it still has the darling "old home" features. There is a new front door, new lighting, new landscaping and the addition off of the side is completely re-built. The owners had the back yard landscaped and it is such a beautiful space, perfect for entertaining or sitting around the table talking late into the night! 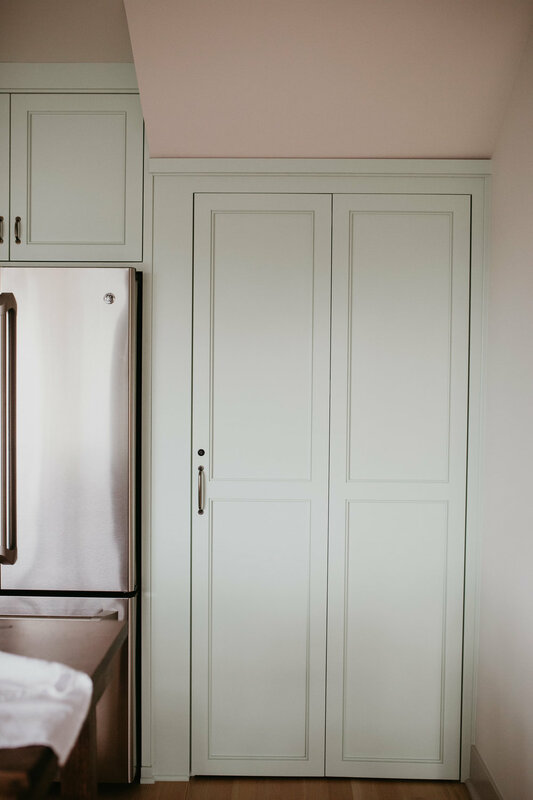 I would say the cabinetry is one of my favorite features in this newly designed and remodeled kitchen. It's all of those little details that really add up to the overall feel! The inset doors, the molding details, the toe kick, when it's all thought through it really completes a space! The cabinet color is SW Supreme Green, it's a fresh and soft minty green. The countertops are a quartz, such a great option for any kitchen, but especially a vacation rental. 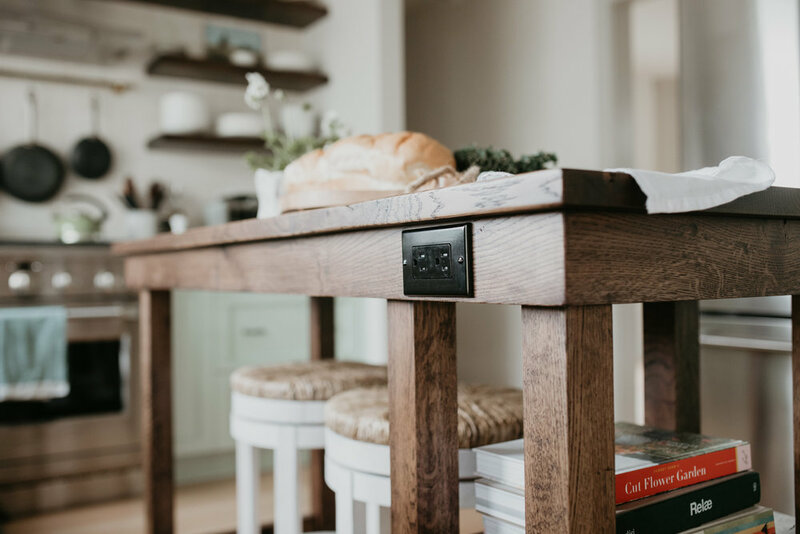 This darling little island is actually built-in and has an electrical outlet. There wasn't the room for a large island, but the space was too big to not have anything in the middle. Having power at a small island like this is so convenient! Matt used some hickory he had at the barn and stained it dark, to match the floating shelves. And just look at.....I love how the owner slid two bar stools under the island so you can chat while working. I hope you enjoyed this little bit of kitchen inspiration! I will post some pictures of the bathrooms soon. They are calling for snow and ice tonight so I am getting ready to make some soup and snuggle with my favorite people to watch the snow fall. Have a wonderful week friends! If you have questions about specific finishes, please feel free to email or comment.